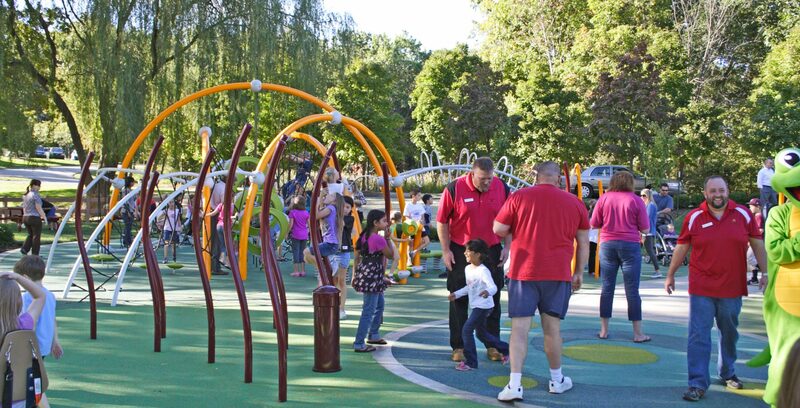 The Cranberry Uniting Playground celebrates universal design by providing a sensory-rich, accessible play environment for children of all ages and abilities. 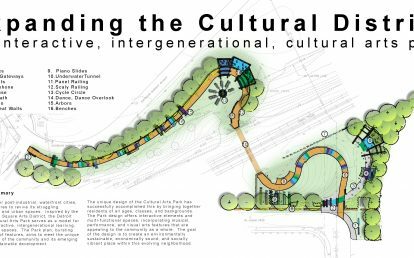 The playground layout is organized as a representation of Cranberry Township’s past, present and future. 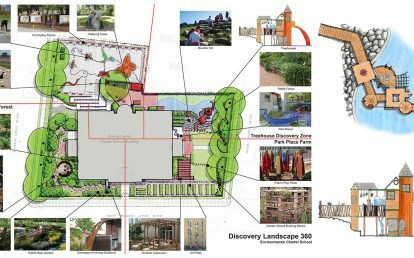 Sensory experiences, cooperation, discovery and pretend play, as well as physical activity, are incorporated into three interconnected themed play spaces. 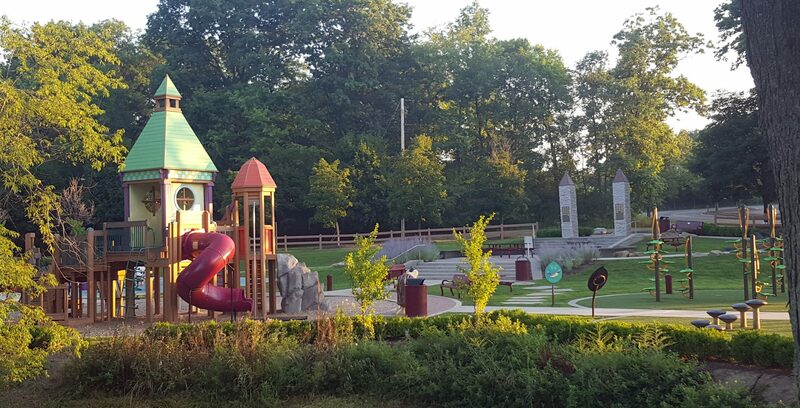 The “Yesterday” play space has a rustic theme that reflects Cranberry Township’s rural past. It features tree and vine climbers, sheep spring rockers, a log tunnel, rolling play hills, a musical mushroom that chimes when spun, and push button activated speakers that play nature sounds. 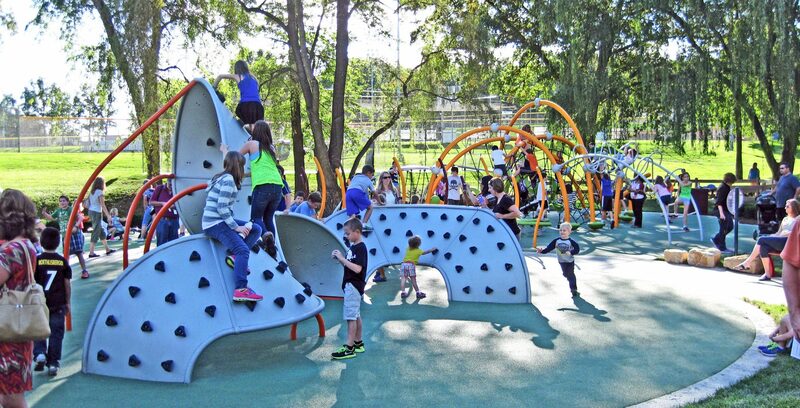 The central element of the “Today” play space is a colorful clock tower climber with slides. 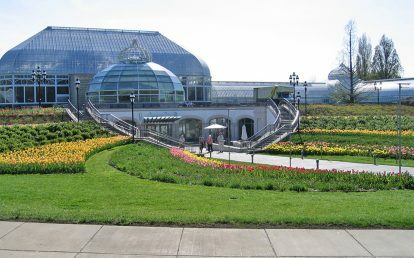 A chime on a motion sensor sounds when children approach the tower. The “Tomorrow” play space has colorful futuristic mobius climbers, a dome net, and wavy poles, as well as colorful tuned drums to play. 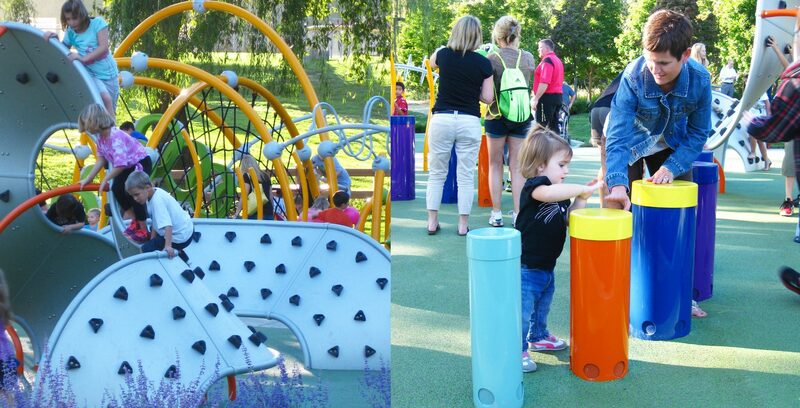 A variety of ground surfaces, colors, and textures throughout all three play areas encourage movement and exploration. 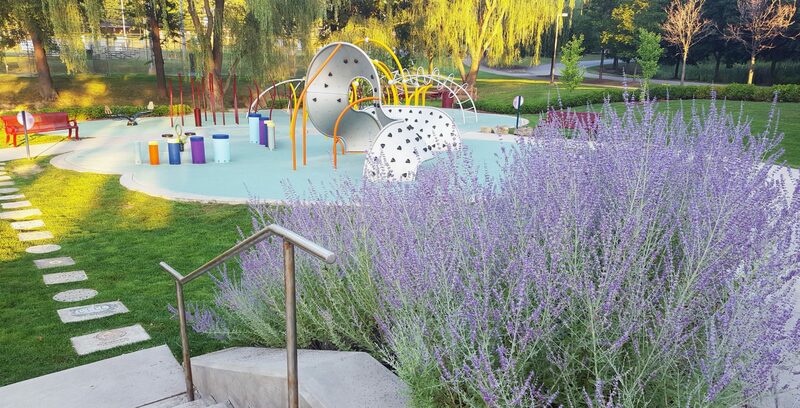 Kids can follow textured concrete borders with hand prints and leaf prints that surround the play surface. 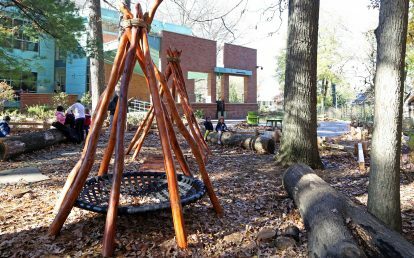 Caregivers can relax while keeping an eye on their kids in the gathering space that overlooks the playground. Nearby, an accessible ball-rolling through lets children explore cause and effect, gravity and physics. 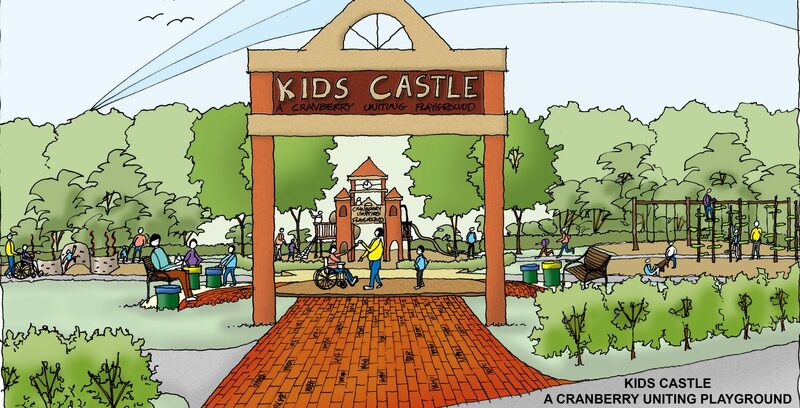 The Kids Castle Cranberry Uniting Playground brings kids and families together. 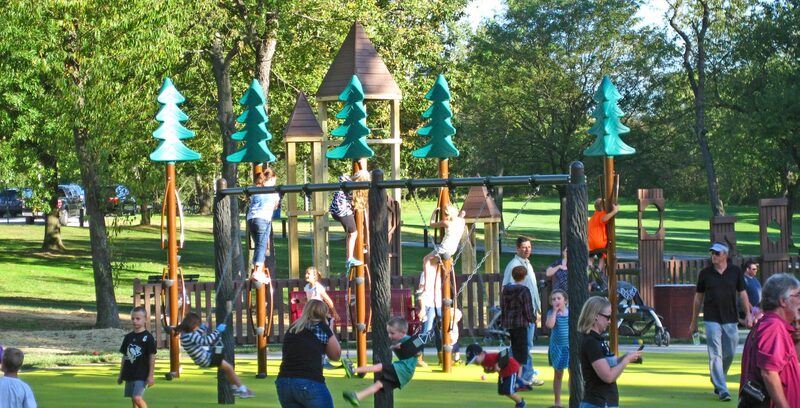 Accessible themed play elements, themed tree and vine climbers, sheep spring rockers, log tunnel, mushroom steppers, rolling play hill, nature sounds speakers, musical mushroom chime, clock tower climber with kid activated chime, mobius climber, dome net climber, wavy pole climbers, tuned drums, brick paving, exposed aggregate concrete, wood plank pavers, artificial turf playground surface, rubber playground surface, textured leaf and hand print border, gravel paving, stepping stones, accessible ball rolling troughs, gathering space, seat walls, stone tower entry feature, themed fencing. 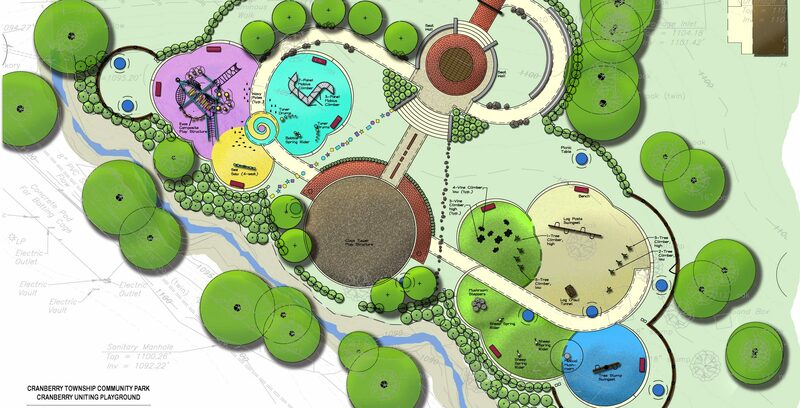 Master planning, playground design, construction documentation, cost estimating, construction observation.